The Retro Becca Quilted bag patent Lipstick red & White. This is a perfect vintage inspired large square bag for work or other occasion where you need to carry more stuff. The white accents and quilted stiches gives this bag a cool retro look! 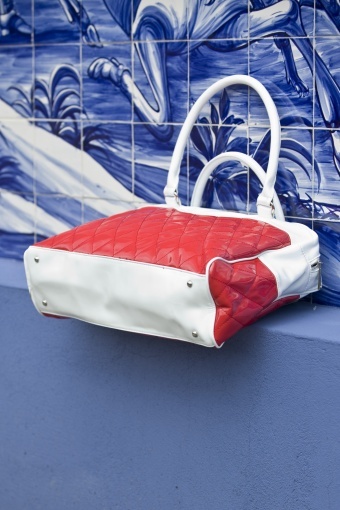 Made of glossy patent red & white faux leather. Large silver zipper and silver metal detailing. Silver metal feet. Interior rockabella black fabric satin with white roses and small zipper pocket. Can also be used as a 15" laptop bag. Kim wears the Sindy Sailor dress.